At last - ACUVUE's flagship lens is available for people with astigmatism! Welcome to ACUVUE Oasys contact lenses. It doesn't matter if you spend your time inside or outdoors - challenging conditions can make your eyes feel tired and dry when you wear contact lenses. Long hours in front of a computer screen can also dry out the eyes. ACUVUE Oasys with Hydraclear Plus keeps your eyes so moist and fresh you'll forget you're wearing contact lenses. Perfect comfort, with a 100% satisfaction guarantee! 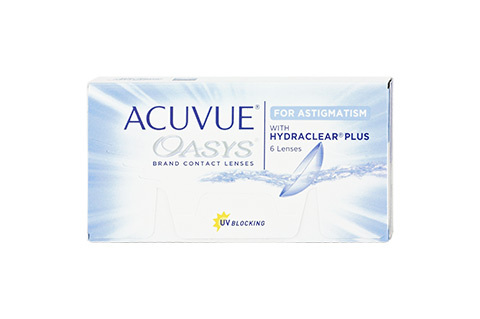 Mister Spex advises all online purchasers of ACUVUE Oasys for Astigmatism contact lenses: the contact lenses, ACUVUE Oasys for Astigmatism, should always be fitted to your eyes by an eye doctor or optician. The period between fittings, unless otherwise prescribed by an eye doctor or optician, should not exceed 6 months. You should go for regular check-ups. You should also strictly follow the recommended wearing time from the manufacturer Johnson & Johnson/your eye doctor/optician's for ACUVUE Oasys for Astigmatism contact lenses. It is your own personal responsibility to make yourself aware of the care instructions for ACUVUE Oasys for Astigmatism contact lenses and to follow them accordingly. In case of eye irritation or visual impairments while wearing ACUVUE Oasys for Astigmatism, remove the contact lenses immediately and consult an eye doctor or optician. Damaged contact lenses should be replaced immediately.